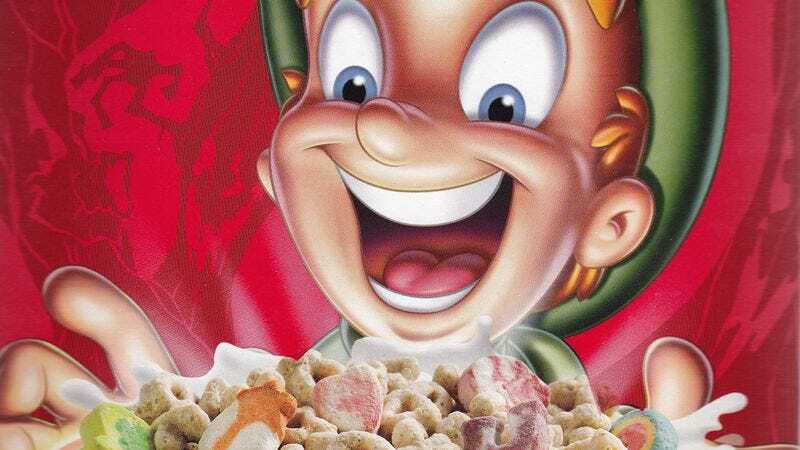 Confirming what many insane people have long suspected but few have thought to put into academic study, researchers at Cornell University have found that cereal boxes are looking at children and bending them to their will. In a newly released report titled “Eyes In The Aisles: Why Is Cap’n Crunch Looking Down At My Child?”—a report that, somehow, had nothing to do with Cap’n Crunch’s surprisingly uppity attitude—researchers looked at 65 cereals across 10 different grocery stores to examine how they’re being marketed to children. There they confirmed that the most obviously kid-friendly ones were typically placed on the bottom two shelves—all the easier to be grabbed by toddlers who are then screamed at while you try to slide by, grimacing as suppressed feelings of shame are dredged from your subconscious. More interesting were the findings on the cereals’ cartoon mascots, whose eyes were discovered to have an average “downward gaze at an angle of 9.67 degrees.” While adults might attribute this to their having some modicum of shame—say, Count Chocula’s embarrassment at being some kind of vampire for chocolate, which makes zero sense—it’s more likely they’re actually drawn to make eye contact with children, with the mascots’ eyes hovering around 20 inches above the ground. To demonstrate, Cornell sent a man to the grocery store to bark, “Why is Cap’n Crunch looking down at me? !” in the cereal aisle, but it was okay, because he was wearing a suit. Furthermore, the study postulated that the eye contact creates “increased feelings of trust and connection”—even in adults. Researchers also brought in 63 lonely and/or stoned university students, who were found to be “more likely to pick Trix over Fruity Pebbles when the rabbit’s eyes were digitally manipulated to look out at them.” Unfortunately, the report does not say whether these 63 students then asked the rabbit what it wanted from them. Did it want them to kill the other 37 students? Silly rabbit. Anyway, as Business Week notes, despite the evidence, the study does not go so far as to “state or mean to infer that spokes-characters are deliberately designed to direct their gaze downward in order to make eye contact with children.” Indeed, there may be other factors that explain why kids are drawn to brightly colored, cartoon-adorned boxes full of crunchy sugar. For example, the body’s natural need for riboflavin. In related news, the Quaker Oats man is smiling like that because he knows what you did.